I tried the pattern as a hand knit and had difficulty keeping track of the reversals of twists front and back, so I headed back to my more familiar territory, machine knitting, and to the bulky machine to make the number of transfers a bit more manageable. 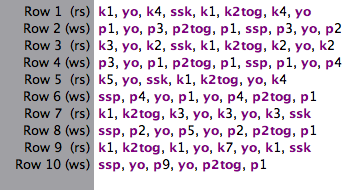 The repeat is 14 stitches wide, outside the range of an effective repeat for a punchcard, but with transfers every row there is another way to use a card that requires no punching. Observing familiar rules, and text or symbols that are meaningful to us for the particular project (ie also for racking sequences), the card is used for notekeeping rather than needle selection. The carriage is set to KC, set for normal knit, no cam buttons in use. Because no holes are punched, there will be no needle selection. The card is locked on row 1 as usual prior to the first row of any pattern knitting , set to advance normally, and in my scribbly version it reminded me of several things. Each pattern segment is 5 rows, with the dark stripe indicating the beginning of each new segment. The numbers on alternate sides show the number of stitches that need to be transferrd with the aid of tools, leaving an empty needle that will create the hole, and overlapping stitches on either side of a center point in part of each motif. 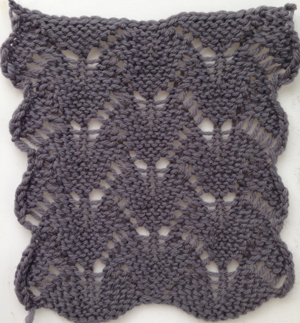 I worked with 2 repeats. 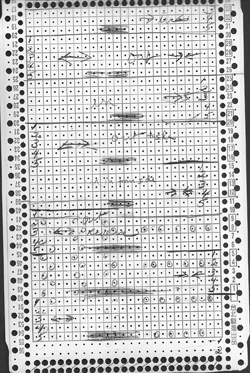 On rows 1-5 as marked on punchcard, stitches were trasferred beginning on the right, toward the right side edge of the knit, then following the remainder of the partial chart repeat. 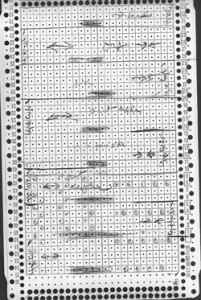 When the next segment of rows was reached as indicated by numbers appearing on the left of the card, beginning on the right edge again, the first group of stitches was transferred away from the knit side edge, once again following the chart segment. 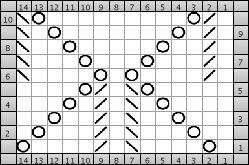 As the lines of holes begin to show, it is easier to see the direction in which one needs to move as is the resulting pattern. 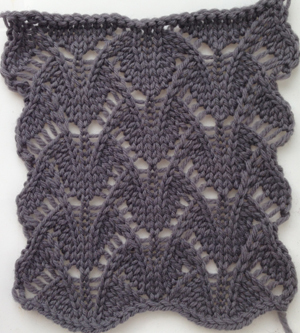 The ridges created as the stitches overlap on either side of the center single knit stitch also can serve as guides in keeping track. I used no weights, just the opposite hand to pull and guide as needed. The number of moves is likely to require a looser tension than usual for any familiar yarn.